When people think about being green, often the first thing that comes to mind is recycling. And though recycling is a favourite of ours, even better is the first of the 3 R’s (points if you yelled out “Reduce!” while reading this). 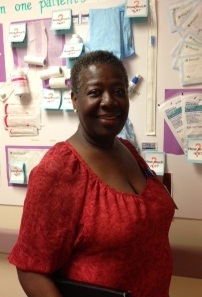 I’ll introduce you to the UHN Jedi-master of reduction, our very own Olga Muir. Olga has made it part of her life’s work to ensure all her staff really think about each and every medical supply they carry into a patient’s room. When something goes into a patient’s room, generally that’s its last stop. Medical supplies are very monogamous that way. If supplies go in that don’t get used, we not only need to buy those supplies again for the next patient, (here’s the insult-to-injury part) we pay to throw out good stuff we’ve wasted. As the Nurse Manager of Orthopaedics and Rheumatology on Toronto Western Hospital’s 9th floor, Olga has the privilege of seeing all the bills for supplies in her department, and what she’s seen is not always pretty. So how do you get very busy nurses, doctors and assistants to stand up and take notice? Put a price on it. That was phase 1 of Olga’s plan. She posted the price list of all the medical supplies in the supply cabinet, with the hope that staff would see that, for example, a bottle of Cavilon costs $6.25. Then maybe they might only bring 1 bottle into a room, instead of 5, which might get thrown out partly used or not used at all. It was a good plan, but with busy staff, not everyone took the time to look at the sheet. It needed more oomph. Enter phase 2…make it big, bold, colourful and fun. Make it a game. Olga designed a giant 3-D poster, stuck on assorted regularly used supplies, and placed a “guess how much this costs” sign next to each and every one. It’s hard to resist flipping the flaps to find out the answers. Who knew a Mepilex Border costs $12? Or a case of adult diapers costs $37.76? Now there’s some oomph! 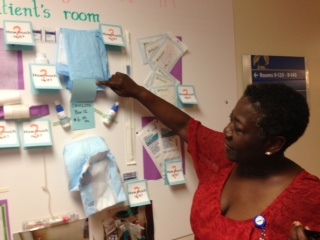 She also took some pictures of real patient rooms with lots of extra supplies floating around…not enough to qualify for an episode of “Hoarders”, but enough to count as “before” pictures for the reduce-waste campaign. One shows the same bottle of sterilizer…5 times. Another shows two pairs of slippers…not such a big deal, except this particular patient was completely bedridden. For health care professionals wondering how many supplies they actually should bring into a room, our Infection Prevention and Control department (IPAC) recommends no more than 24 hours worth. That works for us greenies too. With the 3-D poster up, not everyone was thrilled with the constant reminder. Some staff wanted the poster somewhere less noticeable…maybe the staff room, or down a darkened hallway, or nowhere, really. Olga knew it had to be front and centre…facing the nursing station and accessible to staff, patients and visitors alike. And the message is getting through. A doctor from another floor was so inspired, he brought his colleagues to see it. He thought it should be mandatory viewing for all new physicians. No need to stop there. Absolutely everyone is welcome to stop by the 9th floor at Toronto Western to see Olga’s handiwork (and think before you bring it in the room). 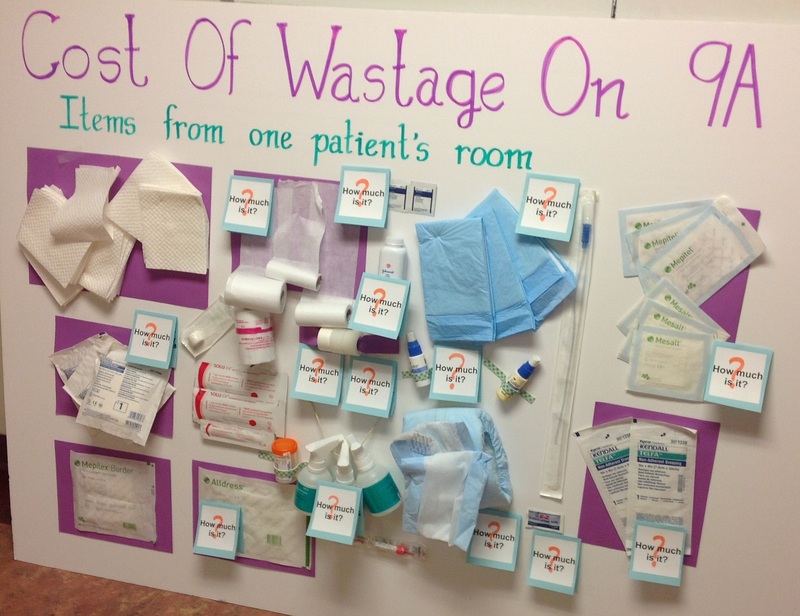 This entry was posted in Beyond Talkin' Trash, Who's Greening at UHN and tagged 3 Rs, medical supplies, waste reduction. Bookmark the permalink.